Short Review: The budget offering from adidas is impressive, functioning both as a high quality entry-level gi and an ideal addition to your holiday packing if you want to train abroad. 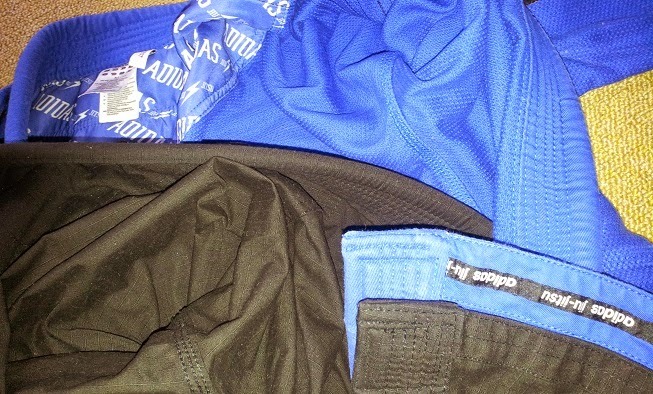 It is unusual for a budget gi to be 100% ripstop, meaning that not only is this great for training trips, it dries super-fast and works perfectly for hot weather. It's plainer than the already fairly plain adidas 'Contest', lacking the three stripes down the arm. Be aware that this doesn't really shrink at all, so pick your size carefully. Available to buy here for £57 in blue/black or £55 in white, meaning it matches the Tatami Nova on price. US customers can go here. Black is $115, blue is $110, white is $100. Update Dec 2016: The adidas Response looks to be even cheaper now, at £47. Full Review: When I think of a budget BJJ gi, up until now the one that has immediately sprung to mind is the Tatami Nova. That's the BJJ gi against which I judge most others: it's cheap, it fits well (on my 5'7 and 66kg frame, at least), it's light, it's plain and it's also durable. It is therefore the gi I always end up recommending to beginners, if they don't want to go with a basic judogi (at around £20 to £30, that's probably always going to be the cheapest option). 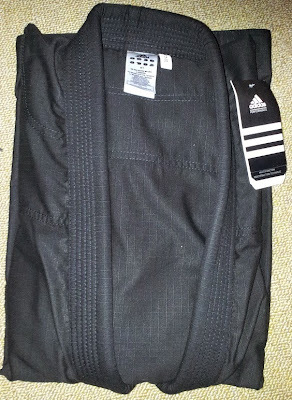 Thanks to adidas, there is now another contender for the prize of best budget BJJ gi. The adidas Response gi is the same price as the Tatami Nova (£55 in white, a few quid more in black or blue). With the new Tatami Minimo, there isn't too much difference in terms of design, as both are equally plain. What marks the Response out is that it's a full ripstop gi, so the jacket can boast a mere 265gsm compared to the Nova's heftier (at least by comparison) 425gsm. That means as well as an entry level gi, the Response also fits into the travel gi category. Previously there was not a lot of choice in the UK. My own travel gi wardrobe consisted of the Gimono from New Zealand and the Gorilla 'Hitman' from Canada. Cimac sent me the adidas Response in December: Birmingham is rather closer than NZL or North America. Fellow keen BJJ travellers in the UK will be pleased to hear that they can get hold of a 'Hitman' equivalent from a local reseller rather than paying shipping and tax costs for the alternatives. Comparing the two, the Response is slightly heavier at 265gsm rather than the Hitman's 250gsm, but that's a very minor difference. The Hitman also appears to crease a lot more than the Response, but it's possible the creases are less noticeable on the adidas gi because I have a black one. Like the Gorilla 'Hitman', the collar on the Response feels beefy. I'd rate the Gimono as my best travel gi, but given it's far more expensive than the adidas, that's possibly an unfair comparison. For a beginner looking for a budget gi, I would say the Nova still edges ahead as the best choice, because on top of its quality and low price, you also get a free white belt. There's also the plus of both women's and men's sizes. To be fair to the Response, it comes in kids sizes too, so also has a decent range. The Response also has a few advantages over the Nova, such as additional belt loops: the Response includes four, as opposed to the Nova's two. In terms of shrinkage, the gi is advertised as pre-shrunk: I didn't notice any significant shrinkage, after over of month of regular use and weekly washes at either 30 or 40 degrees celsius. From the reviews on the adidas Combat Sports site, there are several people complaining about the lack of shrinkage, which is odd (given it says quite clearly that it's pre-shrunk), but does confirm that my experience of no shrinkage isn't unusual. A more valid criticism, at least of the web copy, would be that the size for A3 is listed as suitable for those from 5'8 to 6'0. That's a massive variance, perhaps a mistake. A1 and A2 have a more reasonable 3 inch difference. On the Cimac site, the Brummies are more sensible, with 10cm height difference as you go up each size, starting at 160cm for an A1. For some reason, the trousers on my gi did not come with a stretchy drawstring rope, as it proclaims on the site, but a standard drawstring. The included string is supposed to be the same bungee cord as the Contest, from what I gather. Presuming that to be the case, it is also probably just as long as the Contest drawstring, which for me is too long. However, it is easy enough to chop a cord to your desired length then singe the ends with a candle (I'm speaking from experience here, as I do that with all my bungee cord drawstrings). The extra padding on the knees extends to the shins. When I kneel down, that's just enough to cover my kneecap, same as on the Contest. 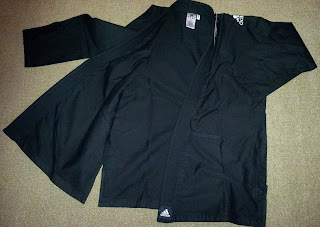 The sleeves with three stripes, a striking part of the Contest gi's design, have gone from the Response. That means there is no potential abrasion from wiping your face (although with ripstop, it's less likely you'd do that given how thin and therefore less absorbent it is). Another change is no inner seam tape. 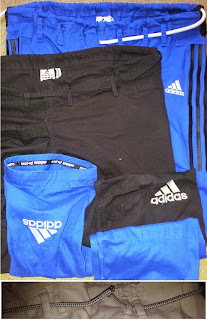 The embroidered adidas logos on the shoulder and trouser legs are much the same, as is the array of reinforcements on the usual stress points: according to the website, these are also all triple-stitched. Like many other gi companies, adidas have plumped for a rubber collar, repeating the common (and I assume reasonable) claim about reducing bacteria as a result. You also get the same satin carry bag as with the Contest (this one was a different colour, as I got a black gi this time rather than blue). The smooth material inside the yoke of the Contest gi, with the same print as the satin bag, is not present in the Response. I would guess that is down to both the reduced cost and in the interests of reducing weight. Available to buy here for £57 in blue/black or £55 in white. US customers can go here. 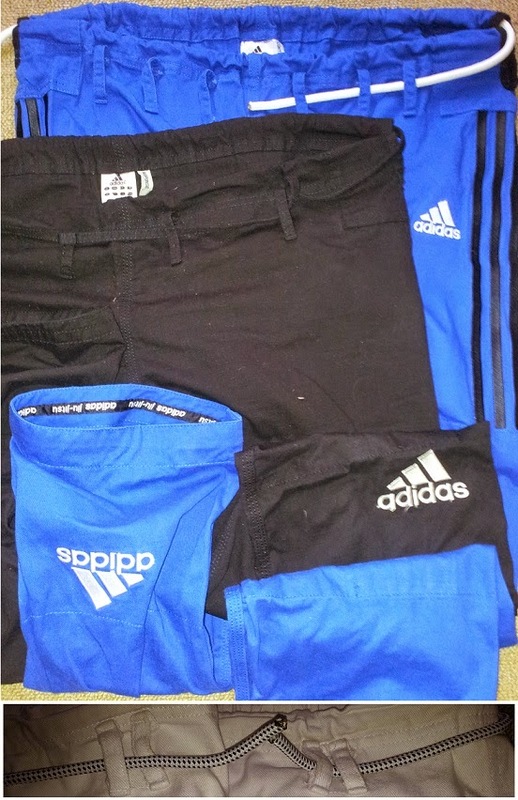 Black is $115, blue is $110, white is $100. For reference, I'm wearing an A1, a good fit on my 5'7" and 145lbs frame.